"Growing up, I ate lunch with my maternal grandparents every other Sunday. They lived in a large, cold apartment and showed their affection in a restrained manner; so I spent most of my time sitting in a chair trying to behave". This first sentence from Rayyane Tabet's performanceDear Victoria marks the start of an artistic project and quest, based on a family story. A spy story? 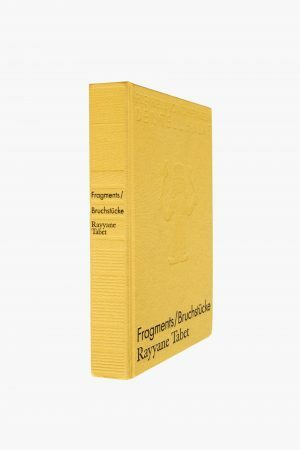 The book "Fragments" was designed by the artist as an installation, coupled with a performance, and is inspired by a family legend about Rayyane Tabet’s great-grand-father. The book accompanies an exhibition which travelled from the Kunstverein in Hamburg to Beirut. Rayyane Tabet (b. 1983, Achqout, Lebanon) lives and works in Beirut. He received a Bachelor in Architecture from The Cooper Union in New York and a Masters in Fine Arts from the University of California in San Diego. He has had solo shows at Kunstverein in Hamburg (2017), daadgalerie, Berlin (2017), Witte de With center for Contemporary Art, Rotterdam (2017), Museo Marino Marini, Florence (2016) and TROUW Amsterdam (2014). His work has featured in the 21st Biennale of Sydney (2018), the 15th Istanbul Biennial (2017), the 32nd São Paulo Biennial (2016), the 6th Marrakech Biennale (2016), the 10th & 12th Sharjah Biennial (2011 & 2015), the 55th Venice Biennial (2013), and the 2nd New Museum Triennial (2012). He is the recipient of the Emerging Artist Award of the Sharjah Biennial (2011), the Jury Prize of the Future Generation Art Prize (2012) and the Abraaj Group Art Prize (2013).